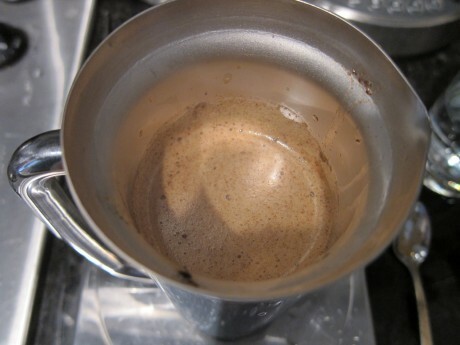 This past Saturday my wife warned me in advance that the coffee she made was “a little weak”. I asked why and she said that she let the Toddler measure the beans. While true that Lila has been helping me measure and make French press coffee since she’s been old enough to pull up a chair, she can’t read and hence has no idea how to tell when the digital scale registers the correct amount of beans. Oh right, they didn’t use the scale either. It was around Christmastime last year that I got right into making coffee and employing a scale, thermometer and taking care of the right grind, water ratios and brew times. It was sort of a natural place to go after rebranding Elysian Coffee and really understanding what goes into a great cup of coffee as part of the process. We had the good beans going in the office, but were ruining them in the process of using a stove top moka pot (you know, those ubiquitous Italian espresso makers). Turns out, of all the methods this is the worst, since it fundamentally requires the water to boil to pass through the grounds. A real no-no in terms of drawing the best out of the beans. Inherently, this is going to give you a bitter cup of coffee. In fact, the passionate experts at Elysian insisted we stop and set us up with a gorgeous, Dutch designed machine called a Technivorm Moccamaster and a proper burr grinder. Having proper coffee at the studio meant there was only one way to go at home. Yes, I was becoming a coffee snob, so what? At home I am known for being a bit of a control freak and stickler in the kitchen, so when I started monitoring the kettle with an instant read thermometer and using the digital scale to weigh beans and water I got some eye rolling and a ‘you can’t be serious’ vibe, even though I think it wasn’t really all that surprising. So, back to last Saturday. I poured out the coffee and started a new batch. I think my wife was a little upset, but life’s too short to submit to bad coffee. As I was going through the process, a soothing ritual in my opinion, I was thinking about it some more, and of ways to instill some appreciation for the coffee making in my wife. Then it struck me: coffee is a recipe. Since my wife is a baker and baking requires precision she wouldn’t bake cookies without the right ingredients, butter at the right temperature, proper ratios of flour, baking soda, etc. Would she? No. Could she get something that could pass for a decent cookie by winging it? You bet. Could she nail the perfect cookie every time? Not a chance. Could the Toddler, left to her own idea of how to make cookies be relied upon to make them well yet? You get the idea. With that out of the way, let’s talk about the French Press. 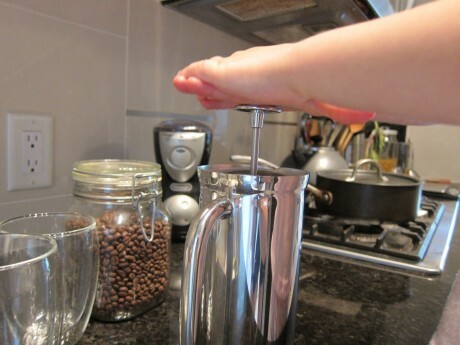 As tissue has become Kleenex, so has French Press become Bodum, but that’s another story. While the hipster barrista scene is all about the pour-over, the classic press is still a viable option. However, there are improvements afoot. I love when someone takes a design that’s been around forever and does something so simple and effective as to totally reinvent it. Enter local Vancouver company, Espro. Founded on the postulation of whether one could “design a tamper that clicks at 30 lbs of force”, and other questions such as “Why is steaming milk difficult?” and “Why is it so tough to make great coffee at home consistently?” (see above for the answer to that last one). The answers lie in clever and innovative devices such as a calibrated tamper, toroid steaming pitcher, and their wonderful Press. 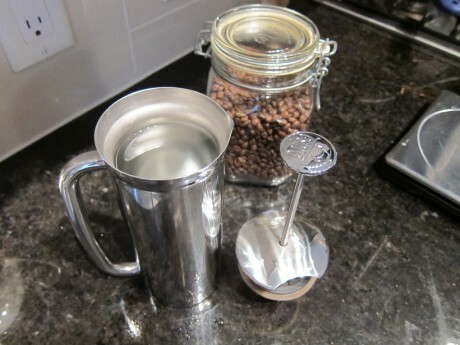 Now, you can get a French Press in double wall stainless steel, that’s not the real innovation here. What’s unique is the special basket-like 2-stage microfilter part of the press. The company claims that this “preserves all of the freshly brewed flavours…and keeps the grounds out of your cup”. 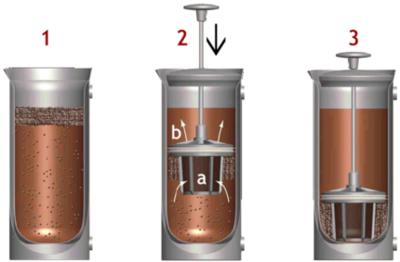 Here’s a detailed description of how it works, but basically the filter is made in two parts: the first is vertical and reaches below the top layer of the grounds to the clean coffee and lets the oils seep through at the top; the second filter is horizontal and keeps the grounds out of your cup. 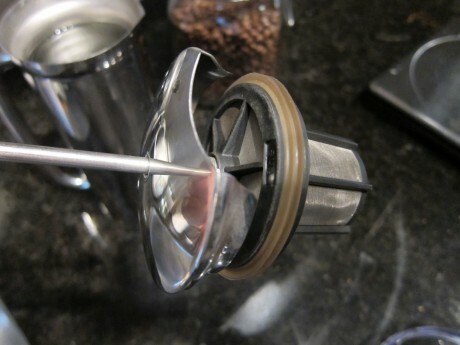 An o-ring seals the whole apparatus against the inside wall of the pot to ensure all the liquid passes through the filters. The Espro press micro-filtration process. That cup of coffee I re-brewed for myself on Saturday morning, I used the Espro. How’s it keep pace with the office machine? Well, I was intrigued with making a direct comparison, but you know, I just haven’t been able to part with it at home yet. Have to say, the claims are true and this little wonder is delivering great cup after great cup. Very clean. I’ve probably brewed about a dozen different types of beans through the device and each is a real pleasure. When using more exact brewing methods you do get rather more particular in your bean selections. As much as the fruity, earthy and other flavour nuances come alive when you brew well, if you use crap beans you get enhanced crap coffee. Not pleasant, so don’t. There is one issue I have with the Espro: its size. Billed as a three-cupper, there’s no way this thing delivers three cups of coffee unless I’m filling playtime tea cups. The yield is strictly a single serving. Not great for mornings when it’s two of us and we need more than a small fix. Don’t get me wrong, I enjoy the process of making coffee, but I don’t really want to do it three or four times in a row. I queried Espro on this and the response was that they made a slight error, intending the 3 cups to be “European tester” size, not expecting that most people expect a cup to be about 8 oz. To further contribute to the issue, the micro-filter basket when fully compressed, leaves a fair amount of water in the bottom (you can see this in the diagram). While not filtered, it makes me feel like I’m wasting precious coffee that I’d otherwise really wish was in my cup. On the plus side, they are developing a larger model and a filter that may address this issue in some improved way. Can’t wait. This small model retails for about $70. That’s a fair amount more than a standard Bodum. 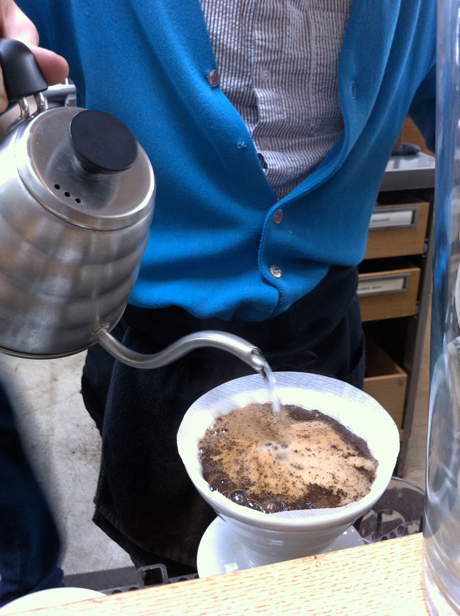 In comparison, a ceramic, 2-cup Hario v60 runs about $24 plus paper filters. Is it worth it? I think yes, but recommend waiting for the larger model unless you’re only a one-cupper since you can always make less in a bigger pot. 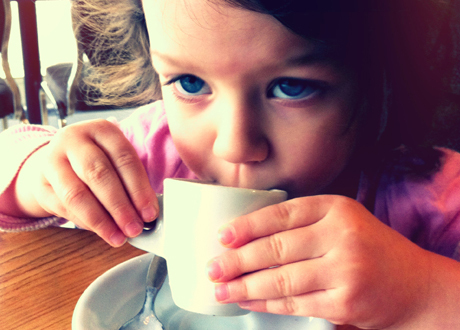 The Toddler’s and my weekend ritual of making great coffee continues. I do look forward to her being able to read numbers, and my wife’s adoption of our methodology. I’d like to enjoy her coffee as much as I do her cookies. The Espro Press ready to go. Close up of the micro-filter 'basket'. The o-ring seals against the inside wall of the press preventing any grounds or liquid from passing around the filters. Pouring in the water: 300g to 18g of beans. A smooth, steady and slow press so simple a three year old girl can do it. 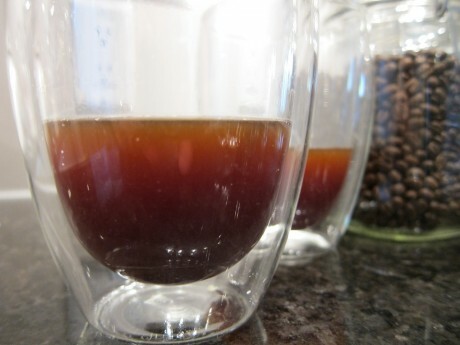 Pouring perfect coffee into my huge Bodum thermal glasses. Not enough for more than one cup though. Sad. A really clean brew for a press. Excellent article. I’m not quite so fanatical about coffee, but I am definitely enjoying the French press that Nancy bought me. Thanks. Well, if you want a really simple guide to upping your game, check out the Intelligentsia iPhone app. 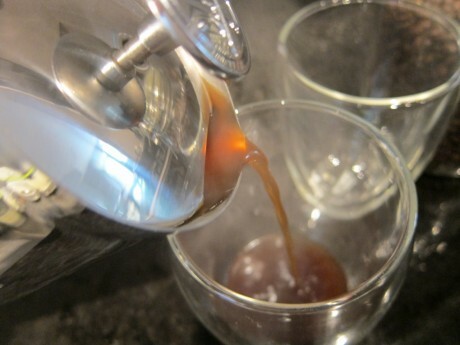 It’s a handy resource and step-by-step guide to several different types of brewing methods, French press included. As the much-maligned and long-suffering wife, I deserve a medal. Or something. And in rebuttal: please see this post on baking by feel. The wait may be over soon. Espro is launching the larger size press via Kickstarter. Check it out here http://kck.st/t3ZwHc.